I love the core message of the Peace Corps, spreading peace and friendship. I am also passionate about working with children and learning about different cultures. Cymone and one of her students. 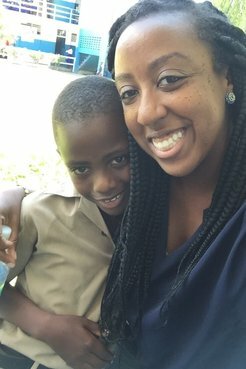 A major reason I chose to serve as a Peace Corps Volunteer in Jamaica is because I wanted to be close to my family in the United States. Both my parents are Jamaican, and my dad knew a couple of Peace Corps Volunteers where he grew up and thought they were amazing. When I found out there was the perfect program for me in Jamaica, I applied! From 2016–18 I served as an education Volunteer in a small, rural community in southeastern Jamaica. I worked one-on-one as a literacy tutor with students at a primary school and carried out various projects to enhance the school library. I got involved in everything I could at school: 4-H, track and field, spelling bee club, field trips and more. The students loved seeing teachers involved in their activities. My biggest success during service was the bonds I created with teachers at my school. I spent most of my first year taking my time and getting to know each and every member of staff. Over time, they opened up and became receptive to my ideas. My teachers encouraged me, looked out for me and taught me so much about the culture. I have such an appreciation for how hard they work and am so thankful for how they welcomed me into their lives. I had to explain to people in my community more often than I expected that Volunteers are not just 20-something white men. Some were used to seeing Volunteers, but they had previously only been white. Others thought I was Jamaican and had a hard time understanding that I was American. Some people could tell by how I walked and dressed that I wasn’t Jamaican, but others assumed I was until my accent gave me away. The principal and teachers at Cymone's school in rural Jamaica. I never lived in Jamaica before serving as a Volunteer, but my family did visit yearly when I was a kid. We used to have a house in Kingston, Jamaica’s capital, and I vividly remember learning to speak patois from the neighbor kids and playing with their dogs. I remember having very sandy Christmases instead of snow and ice. I grew up with so much of Jamaica in my blood, but it was different living there and being immersed in it 24/7. My community, and in particular my host mother, Auntie Pauline, were overjoyed about our shared background. She didn’t have to worry about surprising me with spicy food because I had grown up with it! There were idiosyncrasies that I understood immediately because my parents are Jamaican. For example, I understood how overprotective Jamaicans can be. It comes from a place of love, but can be felt as controlling if you aren’t familiar with the culture. They smother you with love! Auntie Pauline taught me so much about the language, the culture and the food of Jamaica. I will never forget our veranda chats. She also taught me about independence, generosity and strength, and was a major reason why I was able to succeed as a Volunteer. 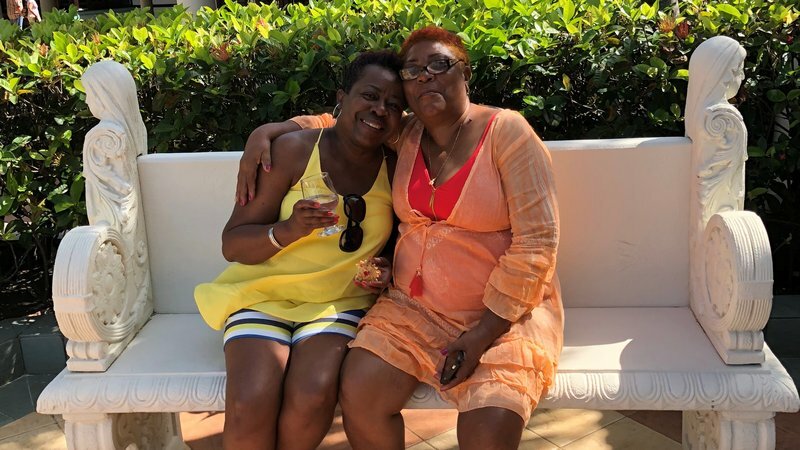 Cymone and her host mother, Auntie Pauline. The language was so much fun for me. I had a great time laughing at myself as I learned. Some people think it sounds crass because it’s not the Queen’s English, but I feel I can truly express how I think and feel in patois. It’s an animated language, full of feeling, and with its own grammar. My service offered me special insight into my family back home. 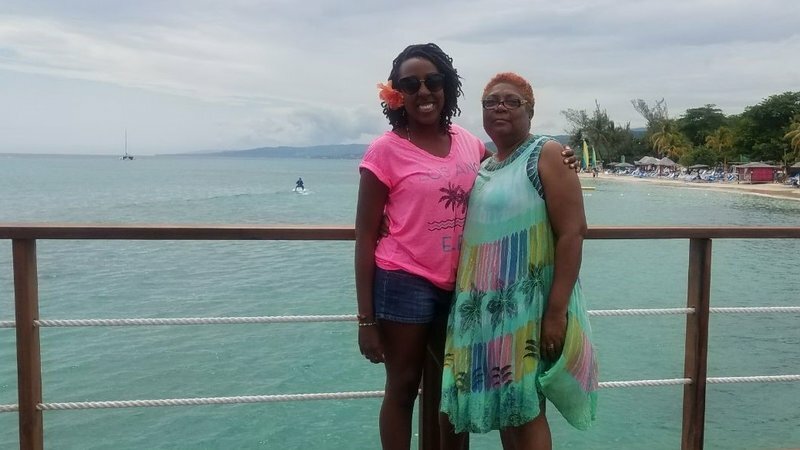 I did not know certain things that my parents did or said—such as putting condensed milk in your coffee, and the immaculate way Jamaicans clean—were uniquely Jamaican until I lived with another Jamaican family. They clean so thoroughly that you can eat off any surface! I still have relatives located in Kingston. I rode two-and-a-half hours on a bus to visit them during my service. The capital is bustling and full of amenities so they thought I was tough (and a little crazy) to live in the country and get used to that life. My family visited me twice in Jamaica. My host family, community members and school staff all got to meet them. My students loved showing off for them and giving them a tour of the school. My host mom made them a big meal and swapped stories with my mother about me. The two are still in contact. Cymone's mother and host mother. Cymone's family visited her twice during her service in Jamaica. I used to be upset that my parents chose to move to the United States because of the cold winters in Chicago, where we lived. Now, after having lived and worked in Jamaica for over two years, I have so much respect for the courage my family had to move to the U.S. and start over. Dad went on to graduate engineering school and Mom became a nurse. They worked so hard to give me and my siblings a better life. I now understand some of the difficulties they faced, and am so proud they were able to thrive here. 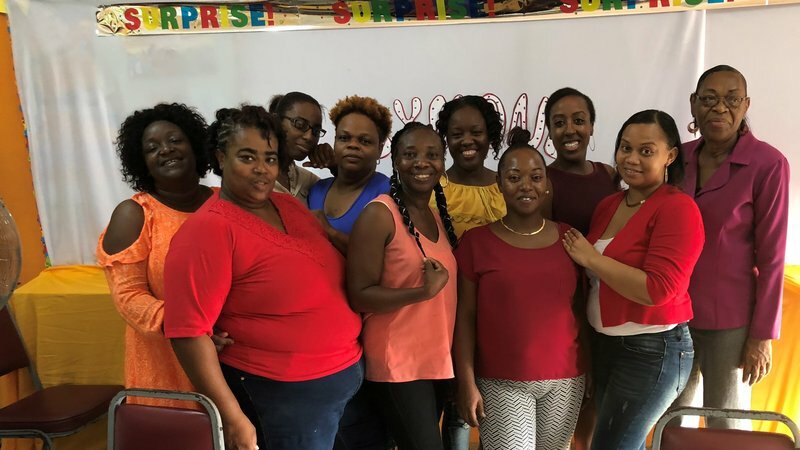 Cymone Wilson served as an education Volunteer in Jamaica from 2016-2018. She received a bachelor's degree in history and psychology from the University of Notre Dame.